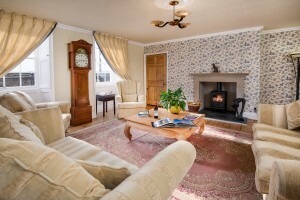 A large cosy guest lounge is available on the Ground Floor. The room is very popular with Guests travelling as a small group or family or when you simply want some extra quiet relaxing space. It contains a wood burning stove that keeps the room warm on a winter’s evening and a small mini-bar containing a range of alcoholic and soft drinks and some snacks, paid for on an honesty basis. 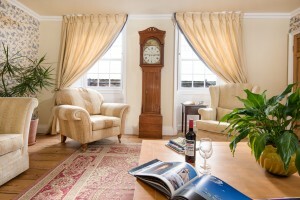 The room is perfect for meeting friends for an aperitif or after dinner drinks. It includes a lot of reading material including tourist information, local history, maps and guides. The perfect place to relax or to socialise with your friends and family.